Scaligera Transfer is a company of car hire with driver Verona NCC Valeggio sul Mincio(VR) offers an impeccable service car hire with driver for all those who wish to move quietly and with amenities for business or pleasure. The characteristics of car hire with driver service are the following: transfers are on booking and the price is agreed before the beginning of the service; rates include VAT 10%, fuel, highway tolls and parking; we are authorized to access in the areas of ZTL and travel lanes; on request we services with driver at your disposal in the various transfers and times of waiting; with our car hire with driver service we have the possibility to operate on all the national and international territory. The service is indicated for all those people who are in need of an efficient service to address their business but also for those who must move for tourism or recreation: to go to the club or to restaurant without the thought of not being able to taste a glass of wine, go shopping and visit the city without the parking problem, take a tour of the Lake Garda enjoying fully the panorama offered. We offer rental service with driver, private taxi transfer toward all the main airports in northern Italy, Verona, Brescia, Bergamo, Milan Malpensa and Linate, Venice and Bologna, seaports and train stations FS. 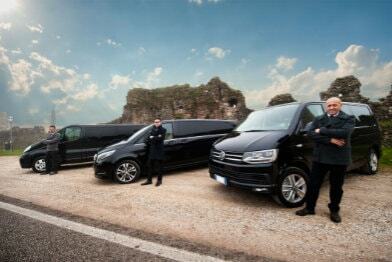 Speed, professionalism and indiscretion always at your service!